This example demonstrates how to implement the PTZ control methods of an IP camera in C#. To implement this example, you need to have OZEKI Camera SDK installed, and a reference to OzekiSDK.dll should be added to your Visual Studio project. An IP camera with pan-tilt-zoom (PTZ) functionalities is capable of directional and zoom controlling remotely. These systems can be remotely controlled by automated systems. The PTZ holders/controls are generally sold separately from the cameras. PTZ is an abbreviation for pan, tilt and zoom and reflects the movement options of the camera. Other types of cameras are ePTZ or virtual pan-tilt-zoom (VPTZ) where there is a high-resolution camera digitally zooming and panning into portions of the image, without any physical camera movement. Ultra-low bandwidth surveillance streaming technologies, such as TVI from Digital Barriers, use VPTZ to stream user-defined areas in higher quality without increasing the overall bandwidth usage. Surveillance cameras of this type are often connected to a digital video recorder which records the full field of view in full quality providing material for further analysis in the future. 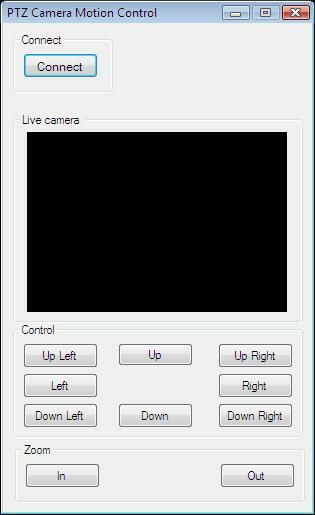 The following sections will present you how to control your PTZ camera. First, we will show the method to physically move the camera. After this, the next session will introduce the zoom functions of the application. These three methods provide the additional functionality of this example. MouseDownMove and MouseUpMove are listening mouse key events and call the Move method which will move and zoom PTZ camera. Below you can find the code that belongs to the interface of the previously presented application. With the help of this section your Windows Forms/WPF Application will be able to work properly.